Planned elections in Pakistan could be delayed by up to a year after President Pervez Musharraf's imposition of emergency rule, the country's PM says. Shaukat Aziz told a news conference that the government remained committed to the democratic process. But he said parliament might change the date of elections planned for January, and gave no end date for the emergency. Rights have been suspended, media has been restricted and hundreds of people arrested under the emergency decree. Mr Aziz said 400 to 500 "preventative arrests" had been made so far, and said the emergency, imposed by Gen Musharraf on Saturday, would last for "as long as is necessary". Small protests have started in the capital, Islamabad, where police and security forces are on the streets surrounding key sites. 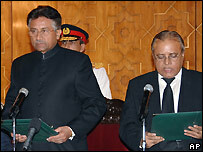 The moves came as the Supreme Court was due to rule on the legality of Gen Musharraf's October election victory. US Secretary of State Condoleezza Rice has said Washington is reviewing the aid which it gives to Pakistan in the wake of Gen Musharraf's decision. "Obviously we are going to have to review the situation with aid, in part because we have to see what may be triggered by certain statutes," Ms Rice said. In recent years Gen Musharraf has been a key ally in Washington's war on terror and has received about $10bn in aid since 2001. "Some of the aid that goes to Pakistan is directly related to the counterterrorism mission," Ms Rice said, adding that that complicated the issue. After a calm start to Sunday, a few dozen people staged a brief protest near the parliament building in Islamabad before police moved in to break up the gathering. Several people were dragged away and arrested, reports the BBC's Syed Shoaib Hasan, in the city. More protests are expected throughout the rest of the day, he adds, with police appearing ready to use force against unauthorised demonstrations. Tough new media restrictions are controlling the news available throughout Pakistan: all non-state TV stations and some radio channels have been taken off the air, as have international services such as BBC World TV. Independent newspapers have been allowed to continue publishing, but Gen Musharraf's decree severely limits what they can report. Local newspapers and key opposition leader Benazir Bhutto accused Gen Musharraf of bringing in martial law without formally declaring it. But Pakistan's attorney general said the prime minister and parliament remained in place and the civilian government would continue to function. Among the hundreds of people arrested since the declaration was Javed Hashmi, acting head of former Prime Minister Nawaz Sharif's Pakistan Muslim League. Gen Musharraf, he said as he was taken away, would pay a price for his decision to restrict freedoms. "Musharraf's days are numbered. Time has come to end the political role of the army." Ms Bhutto, who recently returned to Pakistan from self-imposed exile, flew back to Karachi from a trip abroad upon hearing news of Gen Musharraf's decision. She confirmed that troops were not surrounding her Karachi home, contrary to some earlier reports, and laid out her demands for the holding of free and fair elections. "We the political parties are calling for the restoration of the constitution, and for the holding of the elections under an independent election commission," she told the BBC. There is no word yet whether she plans to enter dialogue with the president or to lead opposition to his rule. 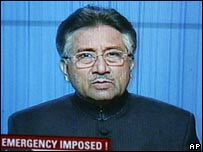 In a TV address on Saturday evening, Gen Musharraf explained his decision, saying the current situation had forced him into making "some very painful decisions". Following the announcement of emergency rule, the country's chief justice was replaced and the Supreme Court surrounded by troops. Chief Justice Iftikhar Chaudhry and eight other judges refused to endorse the emergency order, declaring it unconstitutional, resulting in Mr Chaudhry's dismissal. The Supreme Court was to decide whether Gen Musharraf was eligible to run for re-election last month while remaining army chief. 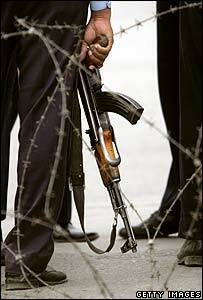 Fears were growing in the government that the court could rule against Gen Musharraf. Pakistani lawyers announced they would strike on Monday in protest at the president's decision.